Only one store in the country has the Copacabana Beach Frappuccino. It’s a test Frappuccino, along side the Rainforest Tea Frappuccino. If you happen to find yourself in San Diego, California, at the Palm and Saturn Starbucks store, try this new Frappuccino. This test is slated to end at the end of July. 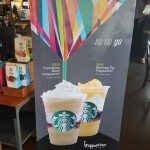 Each time I write about Starbucks test products, I have to give the warning that Starbucks tests many more products than what actually makes it to a national launch. Some test items do eventually into Starbucks stores nationwide, some become regional products, and the majority get axed, for one reason or another. 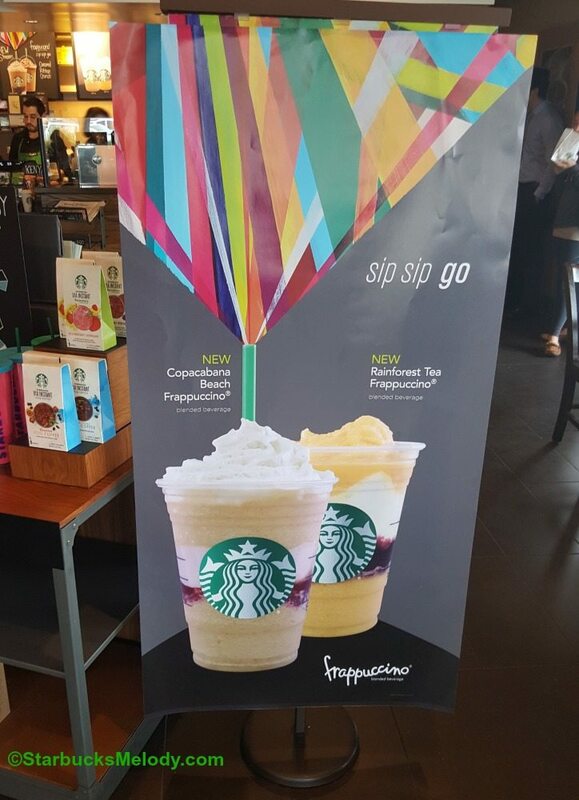 For example, the mini Frappuccino started out as a small test last fall and right now it’s available nationwide. Coconut milk started out as a test item too and now is offered nationwide. The Pink Lime Frozt went through large-scale testing, and was given the axe by Starbucks. 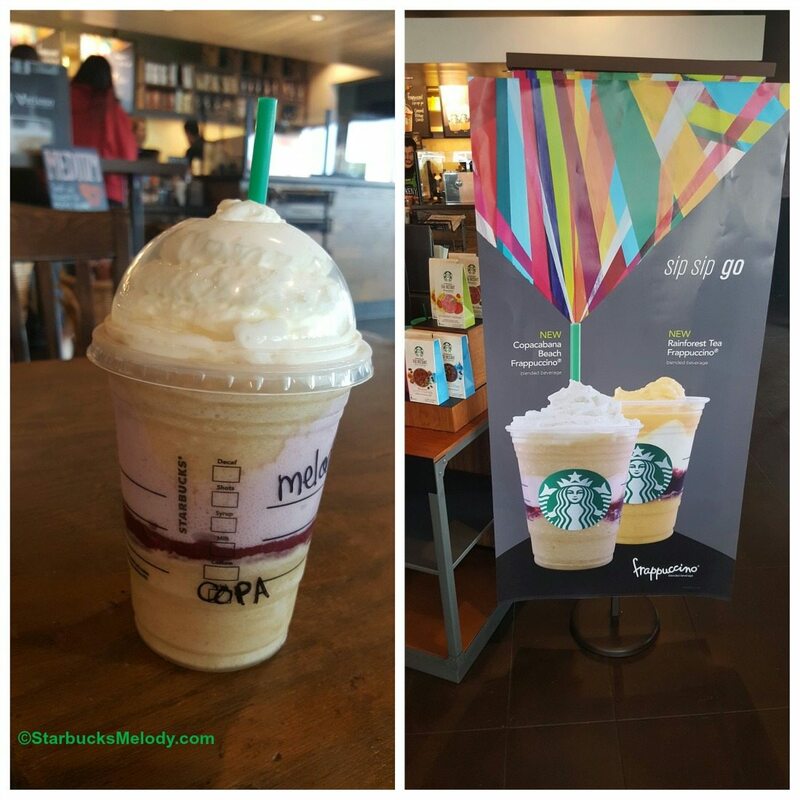 The Copacabana Beach Frappuccino is a coffee-based Frappuccino. Because it’s a single-store test, it is only available in a Grande size. Please don’t try to order it in other sizes. The coffee base is unique to this Starbucks: it uses a Blonde Roast-coffee Frappuccino base. The original Frappuccinos in the 1990s used Starbucks Italian Roast as the coffee base, and still to this day, the Starbucks blended coffee Frappuccino is based on Starbucks Italian Roast. The Blonde roast base is blended with a special pina colada mix, instead of milk. In the middle, the barista layers it with proprietary strawberry puree (not the same one in the Strawberries and Crème Frappuccino) and a berry mousse, which is made in the stores using the whipped cream chargers. The beverage is topped with a pineapple-infused whipped cream. This Frappuccino is amazing! It’s quite sweet and has a lot of pineapple flavor. If for some reason pineapple is not your thing, this might not be for you. 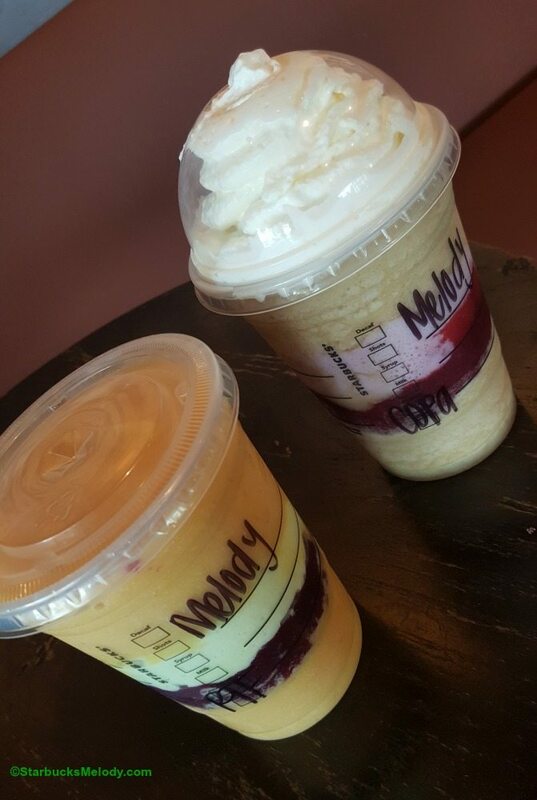 The Rainforest Tea Frappuccino is a burst of citrus and berry flavors! The baristas steep a special proprietary Teavana blend (which has hints of coconut and ginger) to make a concentrate. The tea concentrate gets blended with a pineapple sauce, which is a thick sauce like a mocha sauce. It gets pumped into the drink. The middle puree is a blueberry puree and a special pineapple mousse. Both are incredibly delicious! I especially loved the Rainforest Tea Frapuccino. 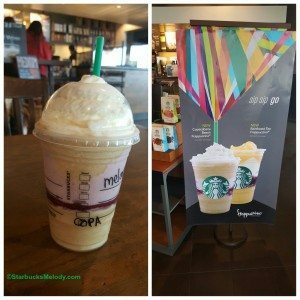 It reminded me of how many, many years ago Starbucks offered a citrus blended Frappuccino. These two drinks do not use overlapping ingredients. The store manager, Michelle, says her customers are really enjoying these drinks! The CUP Fund: Caring Unites Partners. We know about Nitro Cold Brew at Starbucks. What about Nitro tea? And how did you like them? Sounds delicious but sounds like there’s some milk product in, would love to try a dairy free version. I think a Blonde roast coffee base would be delicious. What did you think of the drink, Melody? @Lisa – I ended up ordering 2 of the Copacabana Beach Frappuccinos. I really enjoyed the Veranda – Frappuccino coffee part of it. Somehow I tasted it more in the 2nd one. It’s a nice, light coffee flavor. Really clever to try a Blonde Frappuccino base as part of the test. Great article, Melody! Both sound really interesting and I’d love to try them. Certainly both drinks sound interesting but I think I’ll pass on the sugar and calories. 🙂 I’ll stick to my iced black coffee! !